12.5-13.5 M US Little Kid, Suitable for little kids girls boys foot length 18.4-19.5cm. - Unisex kids children toddler girls boys. - 92% polyester+8% spandex upper, durable and anti-skid rubber sole. - Only 130-170g per pair, makes you feel like there is nothing on your feet. - Breathable and smooth fabrics with fine stretch on uppers, like socks,skin shoes, flexible and comfortable to wear. - Perfect for water park, beach, swimming, swimming and other indoor and outdoor, leisure and other sport activities. 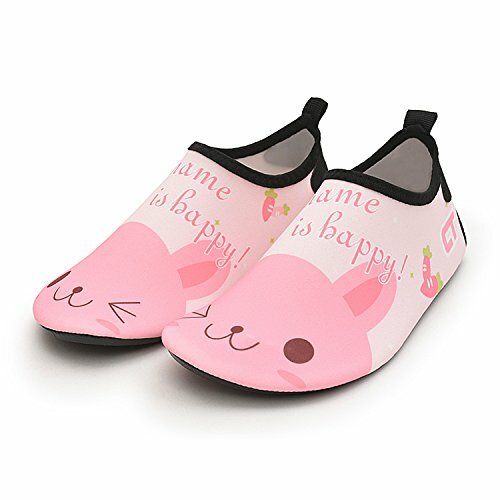 MULTIFUNCTIONAL SHOES - Cute cartoon water barefoot shoes, ideal for girls boys children when go to water park, beach playing, swimming, indoor fitness exercise, surfing, river tracking, driving, yoga, home leisure, travel outside etc. QUICK-DRY OUTER MATERIAL - 92% Polyester+8% Spandex. High stretchy breathable fabric with strong wicking performance offer you with comfortable, fast-drying protection. COMFORTABLE&SAFETY- Soft rubber soles and elastic breathable Upper make your feet very comfortable. Flexible rubber bottom with honeycomb pattern to prevent slipping during exercise and sports activities and protect your feet being hurt by sharp objects. Providing more safety guarantee for you. LIGHTWEIGHT - Ultra lightweight design makes you feel like there is nothing on your feet. Foam inner sole offers a durable cushioning. Slip-on closure, very easy to put on and take off. 3 Size: 6-7 M US Toddler, Suitable for little kids toddler girls boys foot length 13.1-14.1cm; 9.5-10.5 M US Little Kid, Suitable for little kids girls boys foot length 16-16.8cm; 12.5-13.5 M US Little Kid, Suitable for little kids girls boys foot length 18.4-19.5cm. If you have any questions about this product by Greenery-GRE, contact us by completing and submitting the form below. If you are looking for a specif part number, please include it with your message.